Under Pressure of Central Florida Inc. is located in the heart of Central Florida~Lake County Florida serving all of Central Florida. We are certified roof cleaners and specialize in safe no pressure roof cleaning taught by Roof Cleaning Institute of America. We also offer exterior soft washing, concrete cleaning, driveways and sidewalks. 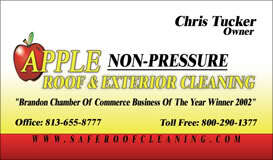 For all your residential and commercial needs, call us today for your FREE estimate. If your county is not listed, please give us a call or send us an email. We have an exstensive data base of Certified Cleaners and will get you in contact with someone in your area. Under Pressure of Central Florida Inc.
Nice to see you here Dwayne!